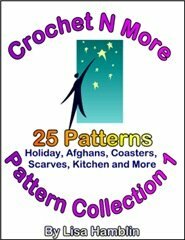 Thank you for your continued support of the Crochet 'N' More Newsletter and website. We thank God for giving us the ability and allowing us to share our free crochet patterns and information with you, all while being a witness for Him. We truly enjoy serving you and hope to be able to continue serving you in the new year. May this Christmas season bring you many happy memories of time spent with family and friends. THE CROSS OF CHRIST BRINGS MAN TO GOD." to Herod after they took gifts to baby Jesus? 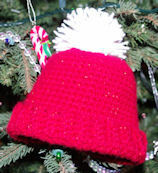 There are many variations of the Bobble Stitch. Bobbles can be comprised of any multiple of stitches. The following are instructions for a Bobble stitch based on 5 double crochet stitches. Though similar a popcorn stitch, a bobble stitch is created by working a series of incomplete stitches and all of those stitches are joined at the top. Popcorn Stitches are worked using completed stitches the first and last stitches being joined to complete the stitch. If you experience pain or discomfort in your hands when crocheting it may be a result of the hook shaft being too slender. Watch the following video for tips to modify your crochet hooks for a more comfortable crochet experience. Just wanted to stop by and say I am so happy you have decided to create and share crochet how to videos on the tube! I look forward to seeing them. I myself sometimes have to read patterns multiple times, pull out stitches and try again when I try a new pattern with stitches I have never made before. Even though I have crocheted for what seems like forever my knowledge of stitches is limited because I have my pet stitches I love... like my hdc that I can't seem to break away from. LOL Lucky because of my experience when I do want to learn something new I do learn quickly once I solve the problems I am having. I am a hands on, visual learner so for me videos are the best. * Perfect background so we can see your hands, yarn and crochet hook. * Your pace is spot on! Others who make videos go to fast. The information you share is fantastic! Very detailed! Example: How to count the number of chains (How to Crochet - Yarn over and Chain Stitch) that was such a great addition to the video! Also what a inspiration your newsletter was to my holiday gift plans! I love the candy cane reindeer! I bought a extra box of candy canes this year so I could tape them to the packages! Now I get to turn them into reindeer! They will look so nice! My brother's dog gets dog bones from us on Christmas each year. This year they are going into a dog bone stocking! Christmas is my favorite holiday. I just love spending time with the family it is the best part for me. Thanks so much! Take Care and Happy Holidays My Creative Friend. all of our "row count" patterns are worked in the same manner. This new technique is similar to crochet and knitting. I think it helps if you already know how to crochet and knit in order to learn to knook. I wasn't particularly fond of it personally but want to share this page with you because it has video tutorials linked that are correctly done, unlike some I've seen online. Love your pattern. What was your gauge? What was the head circumference? Is this a one size fits all type of pattern for the average woman? if you use the same materials and keep an even tension. I am left handed and I recently purchased a double ended crotchet hook. I am having a terrible time getting the hook to stay facing the way I am comfortable. Is there anything I can do, or do they make them just for right handed people? Thanks for you time and consideration in this matter. or a pencil grip to the hook to keep it from turning while you work. I am very interested in making this hat for my 6 week old granddaughter. Do you have adjustments for the Baby Pigtail hat for bigger sizes? I also tend to crochet rather tightly and the last two hats I’ve made have been too small—her head is now 16.25”. Thanks for your help—I know how to crochet, but don’t have a clue how to adjust sizes. pattern page is modeled by a doll that is near newborn size. The number of chains needed will also depend on your personal yarn choice and hook size. up one or two hooks sizes and see how that works out. I'am a beginner so i'm not sure what sl st bet means. I do understand slip stitch but not bet. a fence post... work in between two posts instead of into one. Hey, I am working on the adult size beanie. What do you mean by “sl st between next two stitches”, Round 4? Do you mean to slip stitch in the middle of the chain 3’s from the beginning of round 3? When working between stitches you work into the space between the two stitches. slip stitch in the top of the beginning chain 3 to join. I have a question how do you keep track of your rows and stitches? To keep track of your stitches, try to complete an entire row or round of your pattern before taking a break. If the pattern is complicated... you can write the instructions for each row on index cards. (If the instructions for one row is lengthy you can break it down onto multiple index cards to keep the pattern workable) To keep track of rows you can make a list of the row numbers and check off each one as you go. Thank you so much for your reply, it helps a lot. Schnauzer measures for a cat. Do I measure the chest and go on? made this same sweater pattern for their cats. to help you fit your furry friend. First of all, thank you for such a wonderful site. I just came across this site and i got interested in crocheting (This is the first time I am doing crochet ). I would like to try out the photo frame. Could you please let me know where to get the plastic canvas mentioned (http://www.crochetnmore.com/pictureframe.htm ). We are located in Kansas City, USA. I bought my plastic canvas at Wal-Mart. I cannot understand Row 3. Can you explain a little better? You say on Row 2 to sl stin 2nd ch of beg ch4. I understand that. But Row 3 says to sl st twice in the next ch 4 sp. then ch 4, and sl st in next ch 4. This does not seem to look right. Can you explain a little more clearly? Thank you. I have never learned how to crochet with two colors. Thank you so much for this demo,﻿ I love it. This was great start, thank you! I look forward to﻿ more. Wow, I just stumbled onto your website, and finally found basic information on how to learn to crochet. I wish I had seen this before, as I was getting frustrated with even the easiest stitch.﻿ I have now bookmarked this site, and will sit here with my hook and yarn, and learn right from the bottom up. Thank you ever so much for taking the time to produce these videos and I can hardly wait to start. Can you tell me what the heck she means by the part in red? I’m baffled by “in same st”. I can’t figure out what the “same stitch” is. 3 of the 6 chains count as one double crochet stitch and the other three count as a chain 3 space. from... a/k/a “dc in same st”. This is my first time crocheting with two yarns and it is very important for me to learn to do the square for my niece who is battling leukemia, do have any tips on how work the yarns. I’m sorry to hear that your cousin is battling leukemia. The afghan squares are worked in the same fashion. 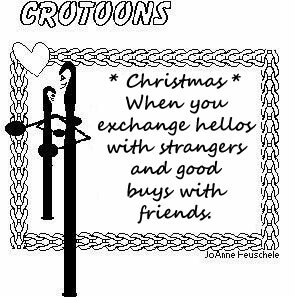 Hi there…I am interested in a relatively easy cross I can crochet as a gift for Christmas. Do you have suggestions for something a little more simple/easier? Hope one of these is suitable. For years and years, my mother and I have been making candy cane reindeer for present toppers, tree decorations, you name it. My best friend and I made them to cover his Christmas tree while we were in college (in 1988). He says he still has one or two left but of course the candy is kind of soft and melted (I thought candy lasted forever lol). Anyway I was so delighted to see your adorable pattern. Thank you. One question, have you tried to do it without the actual candy cane, maybe removing it just before you finish off. I am not sure how that would work since I have just taught myself to crochet a month ago. I’m glad you like the Candy Cane Reindeer pattern. I make the Reindeer and then insert a candy cane. and a fresh one can be used each year. for emailing me... 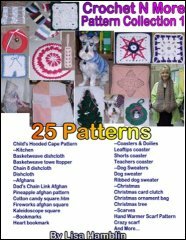 I have added that to the pattern page. Thank you so much for getting back to me. Your timing could not be more perfect. My mother was visiting for Thanksgiving and I showed her the pattern and shared having recently taught myself to crochet (I have been knitting since I was in college). My mother and I used to make the actual candy cane reindeer together and she was delighted with your pattern and I think it was one of the factors in encouraging her to ask me to teach her how to crochet. She is one of those people, an artist, gifted, crafty, and who believes that if she was not born with the skill, she can never learn. By the time she left she was chaining away and had added slip stitches and sc to her tool bag. I really do think your pattern brought her back about 20 years to when she taught me about the candy cane reindeer. Mom... and for her to decide to crochet them is an added bonus! Thank you for adding me to your newsletter list, I have been crocheting since I was 10yrs old and next birthday I will be 64 yrs old. I always say that crocheting is my way of keeping my nerves in check. the Crochetnmore Newsletter has to offer. Like you, crocheting helps me relax also. I’ve searched online with no luck finding the pattern you mentioned. I taught our daughter a version of that prayer when she was little. I will keep this idea in mind for future designs. I see the crochet pattern for the hot pads. Can I use any kind of yarn? I wasn't sure if the hot pan would burn it. After long hesitation, and being unable to find instructions specifically for multi-roll holders, I simply made the original per your free pattern (bless you), crocheted three successive ones onto it. Then I really got into it and added pink ribbon and ribbon roses to the one in our more conservatively decorated guest loo, and made a second one with red (my favorite color) for the one in the ensuite off our master bedroom. Photos are below. Thanks so much for a super pattern; sorry, but I don't use the social networks, myself, but I don't mind you sharing this with your fans if you want to. I am currently trying to do a project and I am not sure of what this term means, so some clarification would be of great assistance. Rows 10-27 – (repeat rows 7,8 & 9) six more times. but do not count Row 10 after I have completed the repeated rows. After this you should have a total of 27 rows altogether in your project. "Why are you rubbing cold cream on your face, mommy?" he asked. "All unattended children given free kitten"
"Salesmen welcome - dog food is expensive." "No appointment necessary, we'll hear you coming." a car without a muffler, then zoomed right toward him. along and offered less, how low would you go?" "Try for more, but I will accept $15," I said and left. did you get for them?" I asked. My friend proudly replied, "Fifteen dollars each." "Who bought them?" I inquired. mother the lens was nowhere to be found. returned with the lens in her hand. A preacher was making a wooden trellis to support a climbing vine. As he was pounding away, he noticed that a little boy was watching him. The youngster did not say a word, so the preacher kept working. He was sure the lad would soon leave -- but he didn't. Pleased at the thought that his work was being admired, the preacher finally said, "Well, son, trying to pick up some pointers on carpentry work?" "Nope. I'm just waiting to hear what a preacher says when he hits his thumb with a hammer." someone to give you an estimate?" Today is my first day driving a cab . . . I've been driving a hearse for the last 25 years." you please do my homework for me?" give it a try, couldn't you?" John went to visit his old grandfather in a secluded area of Georgia. After chatting all night John's grandfather made a breakfast of bacon, eggs and toast. However, John noticed a film on his plate, and questioned his grandfather, "Are these plates clean?" His grandfather replied, "They're as clean as cold water can get them. For lunch John worried that the plates had dried egg and asked, "Are you sure these plates are clean?" The old man said, "I told you those dishes are as clean as cold water can get them. Now I don't want to hear any more about it!" Later that afternoon, as John was leaving, his grandfather's dog started to growl, not letting him pass. John yelled, "Grandfather, your dog won't let me get to my car." 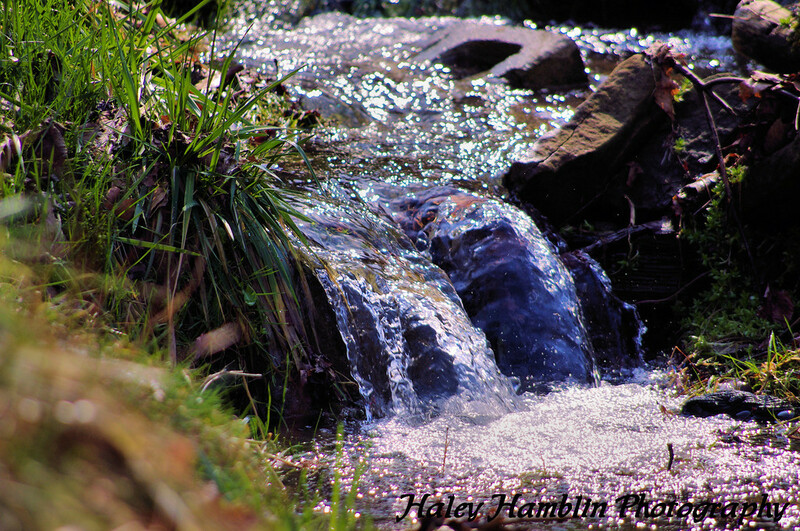 The old man shouted, "Coldwater, go lie down!"